Isn't this fun! 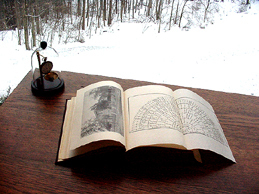 What could be more exciting for us book & old paper lovers than to go exploring? Suddenly the anxiety starts. You have just found something you may want to own. But what if that treasure has just been sold (and the website not yet updated)? What if you won't have the money required until next week? Yikes! Seeking a lower price? New customers, please read the section on Price, below. I am extremely serious about this point, and have removed people from my customer list for not understanding or respecting this important point. 1) Call or e-mail quickly. When collecting rare and one-of-a-kind material, it is essential to call or e-mail immediately to reserve an item which you hope to buy. The best or most unusual pieces are often ordered by several different people within a few hours of appearing in a new catalog or website posting. All of these people will be disappointed except for the first. I cannot update each entry instantly, so it is important to find out if the item is still available, and to reserve it for yourself. - If you need to ask questions before making a decision, (but you get the answering machine when you call, or just prefer to send an e-mail and wait for my reply), never fear. Just reserve the item, and say that you need to ask questions before you can make your final decision. Very cool, and very appropriate! 2) Pay me. Ah, the rock-bottom situation about money! Please understand that this is not a large business. I am just a guy living in the forest trying to make a living. If you make me wait an extra ten days for payment, that is money I do not have to buy groceries, to make a house payment, or to use to acquire more books to sell to you. I really cannot afford to "carry" a customer for an extended period while he or she makes payments. That is what banks are for. A self-employed bookseller receives no monthly paycheck, no employer-subsidized health benefits, no retirement. Every customer check which arrives in the mailbox is precious. - Form of payment. Check or money order. For major purchases, cashier's checks or wire transfers sometimes expedite a transaction. I make as little as 10% profit on many items which I sell. Therefore, I cannot afford to accept credit cards, which would eat up a third of that profit. - PRICE: It is common in the antique world to dicker over price. It is not common (or very nice) to do it with old-fashioned booksellers. I have applied a lifetime of learning and error to the description of each item, and have pondered carefully over how much I should charge for it. To ask at the outset what my "best price" is, is an insult. (Some old-guard booksellers have been known to reply to such a question by doubling the price.) No prima donna, I fully understand that I may be mistaken about a price, or that no one currently has an interest in that book. As time goes by, it is appropriate to ask a bookseller if he or she is inclined to reduce the price on a long-listed item. Sometimes he can do so, sometimes he cannot. How many times in my early career did I lower a price for a new customer, only to receive three orders for the same item a little later at full price! If you go to the grocery store, are you in the habit of asking the clerk to mark down the price on an item for your convenience? Am I not at least as qualified and worthy as the local grocer to earn what I calculate as my honest living? 3) Whew! What a nasty guy! Ah, but now comes the good part: I am an old-fashioned, very traditional bookseller. Any item you buy from me is returnable for any reason (within a week or so - just call quickly to warn me it is coming back). My job is to sell a fully-examined, verified rarity and to protect you, the buyer. If the book or rare paper arrives and it just doesn't speak to you like you hoped, send it back! You are not supposed to feel bad about any purchase from Rick Grunder - Books, ever. - Special arrangements. No one has money available every day of every year. Everyone has periods when they cannot be home to receive shipment. If you really want something badly, but just don't dare buy it yet, please call and discuss the matter. If I have any ability to make it work for you, it will happen. ". . . my only regret is for those I failed to buy - the volumes I was offered and which I turned down because of price or for fear of the amount of books I was accumulating in a period of high activity. Many of these I am unlikely ever to see again. But the rest are with me here . . .
"Once you have started to form your own private library you will find that the pace will quicken. If my own experience as a collector is anything to judge by, or that of many friends absorbed in the same pursuit, you will discover that the more you learn about the hobby the greater your interest in books in general and first or early editions in particular. One never tires of collecting books. The practice is habit-forming. . . .
"Those who have the critical ability and foresight to plough a fresh bibliographical furrow, or tread new paths in book-collecting rather than walk the well-trodden ways, are the pioneers who reap the richest financial benefits and the well-deserved plaudits of the followers of the trend they set. Of those books which posterity has condemned unfairly, and which for many generations were thought to have sunk without trace, there is always the hope - rather, the absolute certainty - that some future collector will recognise their worth. Fashion, in the sense of literary appreciation, may have discarded them, but, with the passage of time, they may well depict the age in which the author allowed us a glimpse of his hopes and fears, and the people around him, that would otherwise have gone unrecorded. As such they are of value and demand to be preserved. The works of some long-dead poet or all-but-forgotten author can be rescued by a collector from undeserved oblivion and be brought to the attention of modern scholarship many years sooner than would normally have been the case. . . . Collectors must not be content to stalk only the majestic giants of literature, or the 'high-spots' and rare ephemera so lovingly clothed in effusive adjectives in the catalogues they receive. By his discoveries in forgotten or unexplored territory he may add something worth while to our knowledge of the past and by doing so he will also add to the sum total of human research and endeavour. "This is one of the several ways in which the book-collector and/or bibliophile can influence literary taste. His library reflects his own individual personality. What one man will seek avidly in every bookshop in the land, crouching over hastily opened catalogues while his breakfast cools on the plate, will leave another completely unmoved. . . .
"This is one of the many aspects that have attracted me to the hobby of book-collecting: the field is so wide and there are so many facets to examine and by-ways to explore that you never have a chance to lose interest. As one door closes another opens. When an author you have been quietly collecting for many years is re-discovered by the critics, you can sit back and relax, fighting any tendency to say 'I told you so!' Your perception will pay handsome financial dividends as your fellow bibliophiles seek out what you left and then pester you for crumbs. But once your one-time favourite is promoted to a literary high-spot, with all that means in hard cash, then it is time to move on." —Eric Quayle, The Collector's Book of Books (London and New York, 1971), pp. 10-11. 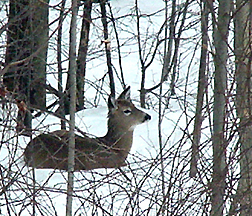 Pictures on this page: At the top, a weary deer rests just beyond the edge of my back yard in early 2001: a tough winter, 192 inches of snow. The next picture shows the main creek, which flows across bedrock, forming the eastern boundary of my land (through a "gulch" to quote the deed, ". . . as it winds and turns 430 feet more or less . . ."). 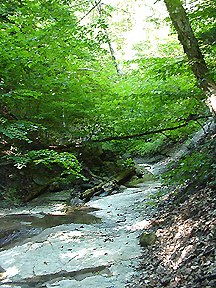 It was nearly dry in August, 2001, providing an ideal "sidewalk" through the woods. Elevation near this point is exactly 1,000 feet above sea level. 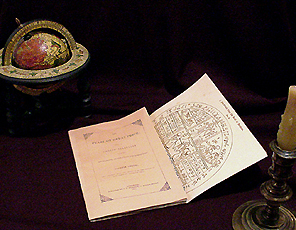 The third and fourth images on this page show, respectively, a first-edition Pearl of Great Price (1851) and a nice copy of the elusive Ancestry and Posterity of Joseph Smith and Emma Hale by Joseph Smith's granddaughter, Mary Audentia Smith Anderson (Independence, 1929), both of which I sold in 2001.